Your Final Journey is an immersive experience that takes viewers through the realms of the ancient Egyptian afterlife, the Duat. This experience can be viewed in Oculus VR and in CAVE. As a member of Studio Duat, I worked as an environment modeler on a team of seven. My responsibilities included environment layout design and 3D modeling. I worked closely with our Art Director and Texture Artist to ensure we had a cohesive vision of what our experience should be like. The story for this experience is based on the Egyptian Land of the Dead myth, where a pharaoh's son takes his father through the realm of the dead, in order to show him that in death everyone is equal when they arrive at the final judgement. Our version has the guest ride through the land of the dead in a boat, until they arrive at the judgement chamber, where Anubis awaits to weight their hearts against the feather of truth. In total, our experience has 4 scenes; The Tomb, Land of Night, Land of Day, and the Judgement Chamber. Each scene takes place in a different environment, with voice-overs telling the guest something about that scene and how it factors into the mythology. I worked primarily on The Tomb and Land of Night. On this project, layouts were especially important because we had to ensure that our viewer would pay attention to the important elements in the scene at the right moments. Early in development, we developed mood boards for each scene, which would influence the layout design and the environment color palettes. Of the 4 scenes, I was responsible for creating the mood board for the Land of Night. In our story, two characters get judged before the guest does. This is our way of trying to establish precedence for how one is judged good or bad. We didn't want to confuse our guests by introducing them at the end, so we first introduced them in the opening scene. The tomb was the opening scene we used to "on-board" our guests into the experience. We wanted to ensure that they knew they were dead. However, as mentioned before, we also needed to introduce our supporting cast. After many iterations, we found that it would be least confusing to have 3 dioramas to represent 3 different burial settings for the each character(guest included). After Sharon, the art director, laid out the environment and lighting for the scene, I was tasked with finding suitable references, modeling and flushing out the scene. I worked closely with Tai, our texture artist, to ensure that the references I gathered had materials that would be feasible for him to make within our time frame, and adequately communicated the story properly. I created several high-res models for the scene and dressed the sets for both our CAVE and VR versions. Initially, our plan was to have the characters rise out of their sarcophagi, so I modeled the interior of all of them. However, due to time constraints, this animation sequence was cut, so the lids of the sarcophagi were positioned off to the side in order to show this additional detail. A panoramic view of the 3 CAVE screens for this scene. This was the second scene in the experience and the first of the 3 open environments. I was made the lead artist on this scene, so I was responsible for creating the mood board. I also developed the concept and the layout. I started off by sketching my interpretation of the Land of Night from the description in the myth. After presenting this to the team, the general consensus was that claustrophobia would be helpful in creating tension in the scene, so it was back to the drawing board (or in this case, Photoshop) to come up with another interpretation. I needed to produce quicker concept art, so I attempted a photobash to create another concept for the scene. Since underground caverns were our target, I decided that a meandering path, that obscured the destination would be dramatic enough to hit the target emotions. With some help from faculty, we were able to decide on additional elements to add the scene. We decided the space should feel expansive and yet tight at the same time. We found several images that could be used for inspiration, and with that I was free to design in earnest. After a couple of tries, I settled on the design being a simple U shape. I used large rock walls to close off the space but also to obscure the view of the destination until the time the was right. At the time of this design, we had planned for a ghostly figure of Anubis to present in each scene, giving the guest the feeling that he was always watching them. Eventually that idea was scrapped. Below is the top down plan created for this scene. The points marked “Events” were areas where something would happen in the scene to add more tension to the scene or draw attention. Some of these were not feasible because we had only one animator and a lot of character animation was needed for the opening and final scenes. However, I managed to put together a list of sound effects that we could use in the scene and get away with not having the VFX present. In Unity, I used cubes with event triggers to demarcate when each sound would happen. I also placed markers for where the sound should originate from to take advantage of 360 sound. These markers and cubes were culled from the rendering at the end. Here are some screenshots of the scene progression in Unity. Most of my work in the last two scenes was pre-production. 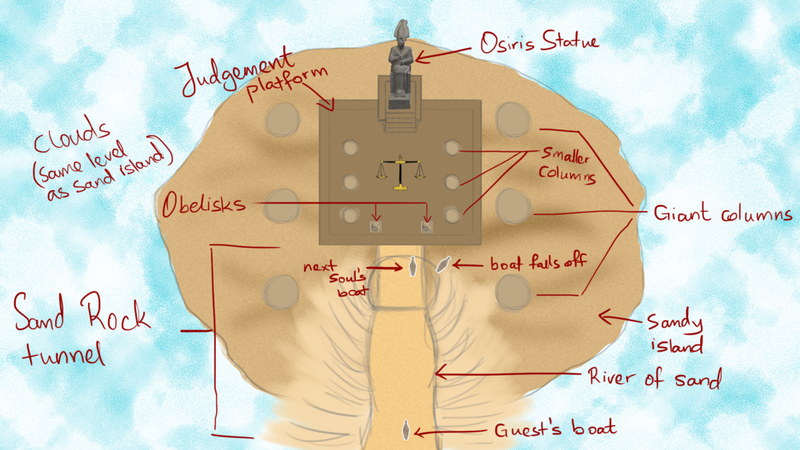 I worked on the layout for the Judgment Chamber. However, the team decided to avoid same for the Land of Day to beat time. I also worked on some props for the Judgement Chamber, and some assets I made for the Tomb scene were reused here as well. Below is a gallery of the work I did in other scenes. Here’s a couple of video’s of the experience running on both platforms. Enjoy! While working on this project, my team also worked on pre-producing another story for an animated short to be worked on by a different team. On this I was supposed to work on layouts for the major scenes in the pre-production. Granted, I had precious little time to work on these, I decided I would provide 3d layouts rather than 2d.